A similar order as with distortion is expected for coma. It should be the smallest on Olympus’ sensor, whose corners are the closest to the center of the frame, higher with Canon 20D and the biggest with sensors of 1.5 times factor. And that’s how it really is, what can be observed clearly in the clippings below. The level of this aberration isn’t small and has a noticeable impact on lowering the image quality at the edge of the frame. It’s worth to notice the fact that even after stopping down by one EV value, coma still has a deforming effect on the circular diode picture placed in the corner of the frame. You could write a whole book on Sigma’s astigmatism, as, firstly, it has a really big impact on the image quality of this lens and, secondly, it causes strange results of tests conducted by editorial offices, which don’t really know how to face this problem. Large astigmatism is easy to notice even at diode pictures, which are used to show coma. Have a look at the clippings at the maximum aperture with the diode placed at the center of the frame. We didn’t obtain a perfectly circular image in any case, and in each you can observe something ray-like going in one direction. 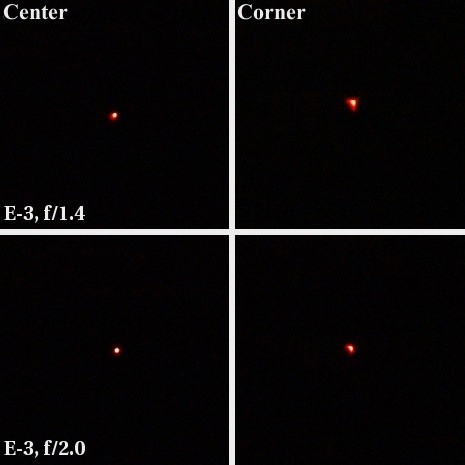 Astigmatism is precisely the inability to show a point light source as a point picture. And the fact that we can see this in our pictures of a not-really circular diode means that the aberration is serious here. Let’s move now to measurements, so to be able to evaluate the size of this aberration more objectively. As we mentioned, the resolution results showed that in the maximum aperture range the most optical aberrations were displayed with Nikon mount, and the least with Canon mount. Let’s see how it looks with the latter first. The picture above shows MTF50 values at every aperture, not averaged, measured on one test chart, separately for the vertical and horizontal border. Let’s image an editorial office that uses only these first borderlines (something everybody does, apart from Lenstip.com). What conclusions would be drawn on the basis of the red dots? That we’re dealing with an outstanding lens, which even at f/1.4 reaches a very good result of almost 38 lpmm. The problem is, while the vertical borderline gives 38 lpmm, in the same picture, the horizontal line gives a result of just over 22 lpmm, and that’s a results we see as weak… The only solution to this situation is measuring values for both borderlines and averaging them, even better for a few test charts. 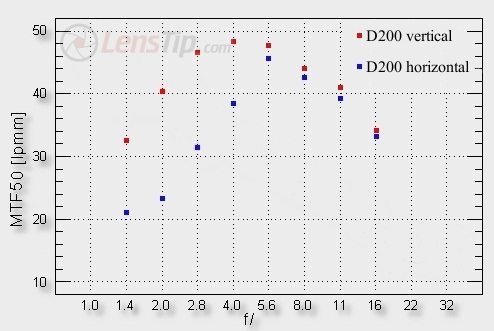 The problem is obviously the bigger, the bigger astigmatism we deal with, which is showed on the graph below obtained after mounting Sigma on Nikon D200. Here we see that the divergences between the vertical and horizontal values stay at a very high level even at f/4.0. This, again, is very important information for those who ask why for evaluating sensors’ quality we don’t use apertures larger than f/5.6.The answer to this is simple. Even if we use a lens of smaller astigmatism than in Sigma, we can’t be sure whether we’re evaluating optics aberrations or sensors’ results. Looking at the behavior at f/5.6-f/16 (especially in the range f/5.6-8) we can trust that the differences in the results are caused by cameras’ sensors. At the end I owe the Readers one more explanation. 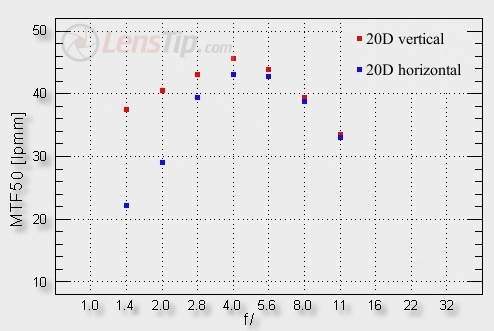 If Pentax K10D sharpens one coordinate, but doesn’t sharpen the other one (or does just slightly), how to measure astigmatism in its case. 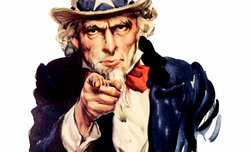 There is a way, but requires much more work from me, without ensuring results as accurate as in other systems. That’s where my reluctance to testing Pentax lenses comes from, as not only do I have to take pictures of more charts, I also have to make an all-out effort with measuring astigmatism, and additionally, at the end I get still smaller accuracy than in other systems and bigger problems with interpreting the results. To be frank, I’m thinking of further testing lenses on K20D, which gives MTFs similar to K10D, but at the same time consistent between horizontal and vertical resolutions. Let’s leave regrets for another time and get straight to facts. Astigmatism in the K10D pictures can be evaluated by taking a large number of pictures at every aperture, each time switching slightly focus. Then you can choose a picture from this set, in which the highest result is obtained by the vertical borderline (sagittal focus) and remember it. Then we choose a picture in which the highest result is obtained by the horizontal borderline (tangential focus) and for it measure again vertical MTF50, which will be lower than in the first case due to astigmatism. The difference will be the higher, the bigger aberration we’re dealing with. Summarizing, on all the mounts apart from Nikon, astigmatism oscillated between 20-25% - it was very large, then. As we mentioned earlier, in the copy with Nikon mount this aberration was the biggest, its level reached an enormous level of 38%. Strona wygenerowana w 0.082 sek.